Naomi knew it was just a matter of time. Once the harvest was over, their livelihood would again be in jeopardy unless…unless a kinsman redeemer would step in and come to their rescue. Boaz, though not the nearest relative, would be their first resort. After all, he already knew Ruth and had shown a concern for her welfare as well as, by extension, Naomi’s own. The time had come for a bold plan. Boaz worked alongside his hired men at the threshing floor—a cleared solid surface of hard-packed dirt or rock—preparing for the final stage of the weeks-long harvest. Ruth watched as this kind kinsman, or was it one of his workers, expertly urged draft animals, whether oxen or donkeys is unclear, to drag heavy threshing sledges back and forth over the sheaves, breaking down the stalks into husks, straw, and grain kernels. Then experienced hands wielding wooden pitchforks lifted the straw away so the process of winnowing could begin. In the cooling evening breezes, waiting crews used winnowing forks, tossing the remaining grain into the air. Mesmerized, Ruth watched lighter stalks and husks (the chaff) be whisked away on capricious currents of wind, and the heavier kernels plummet back to the floor in a haphazard heap. Then mounds of the tawny pellets were scooped up and sifted through trays to remove any remaining dirt and debris. The clean grain was finally ready for immediate use or storage in sealed clay jars. As the last rays of sunlight grew dusky, weary workers allowed themselves to relax, enjoying food and drink, celebrating harvest’s end. Bellies full and hearts merry, first one and then another fell silent, except for an occasional grunt and snore. Ruth’s gaze followed Boaz through the dimness as he made his way to the end of a grain pile, spread his blanket, and quickly dropped off to sleep. Naomi’s instructions had been quite clear: Wash yourself, put on your best garment, go back to the threshing floor, and wait for the moment of opportunity. That time had come. Ruth quietly made her way to where Boaz lay, uncovered his feet, and lay down. Naomi’s strategy was one of enlisting the involvement of the kinsman-redeemer. Now Ruth lay at Boaz’s feet, anticipating the opportunity to bring Naomi’s plan to fruition. His sleep suddenly troubled, she watched him awake with a start sensing her presence in the darkness. “Who are you?” he challenged warily. Ruth responded with her request. “I am you servant Ruth,” she said. “Spread the corner of your garment over me, since you are a kinsman-redeemer” (3:9 NIV). Flattered by Ruth’s request, Boaz commended her for approaching him, since it is likely that he was considerably older than she, and she might well have chosen a younger man. Rather than interpreting her actions as wily and improper, he afforded her only kindness and respect. He encouraged her to wait until morning for the sake of her reputation and for her own protection. Before first light she could safely return to Naomi, and none would be the wiser. Then he would attend to the business at hand. Boaz knew there was a kinsman closer than he, and his integrity dictated that he go to him first before proceeding any further. By rights, this relative (who, though unnamed in the Bible, was obviously known to Boaz) could redeem Elimelech’s land either by buying it back, if it had indeed already been sold, or he could buy it outright. Then Boaz said, “On the day you buy the field from the hand of Naomi, you must also buy it from Ruth the Moabitess, the wife of the dead, to perpetuate the name of the dead through his inheritance” (NKJV). Then Boaz said, “On the day you buy the land from Naomi and from Ruth the Moabitess, you acquire the dead man’s widow, in order to maintain the name of the dead with his property” (NIV). Then Boaz said, “The day you acquire the field from the hand of Naomi, you are also acquiring Ruth the Moabite, the widow of the dead man, to maintain the dead man’s name on his inheritance” (NRSV). And all the people who were at the gate, and the elders, said, “We are witnesses. The LORD make the woman who is coming to your house like Rachel and Leah, the two who built the house of Israel; and may you prosper in Ephrathah and be famous in Bethlehem. May your house be like the house of Perez, whom Tamar bore to Judah, because of the offspring which the LORD will give you from this young woman” (vv. 11-12). So Boaz took Ruth and she became his wife; and when he went in to her, the LORD gave her conception, and she bore a son. Then the women said to Naomi, “Blessed be the LORD, who has not left you this day without a close relative; and may his name be famous in Israel! And may he be to you a restorer of life and a nourisher of your old age; for your daughter-in-law, who loves you, who is better to you than seven sons, has borne him.” Then Naomi took the child and laid him on her bosom, and became a nurse to him. Also the neighbor women gave him a name, saying, “There is a son born to Naomi.” And they called his name Obed. He is the father of Jesse, the father of David” (vv. 13-17). The book of Ruth, in its four short chapters, gives one of the few detailed glimpses into the everyday lives of Old Testament characters in the Bible, and in particular, women. The reader is exposed to the nuances of the desperate plight of three widows, two of whom found themselves displaced and in foreign lands; and marvels at their courageous efforts to survive by hard work and ingenuity. 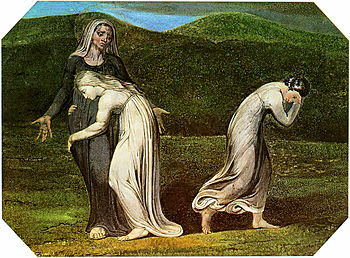 The reader senses the depth of the bond of devotion to both kin and God, and the bitter anguish of loss. The reader observes the realities and rigors of harvest and manual labor; and sits as one of the collective witnesses to the legal proceedings involving rights of inheritance and preservation of a family line. Lastly, the perceptive reader will recognize and value this book as a beautiful exemplar of kindness, the evidence of which is found on every page. What a gift to have The Book of Ruth preserved in the pages of the Bible! For additional reading please view Mary Hendren’s post, Levirate Law– in Confusion. A Ga’al (Strong’s 1350), or kinsman redeemer, could act in several ways. By definition according to http://www.biblestudytools.com/lexicons/hebrew/nas/gaal.html , the kinsman redeemer could marry a brother’s widow to beget a child for him (Deuteronomy 25:5-10), redeem from slavery (Leviticus 25:47-49), redeem land (Leviticus 25:25), or exact vengeance (Numbers 35:19). 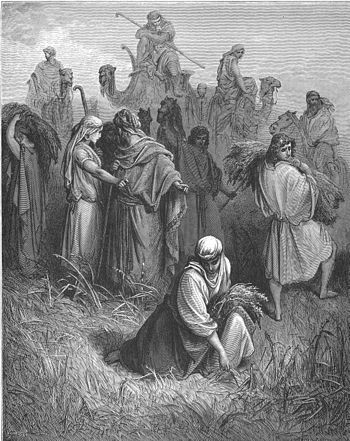 In the book of Ruth, Boaz acted as a levir as well as one who preserved claim to the family property. It is possible that Boaz, and /or others, were overseeing the process. 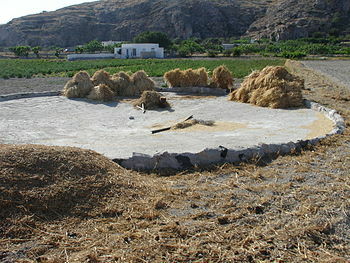 The Archaeological Study Bible, in its cultural and historical note on “The Threshing Floor” (page 608), comments that because the threshing floor was the largest open area within a village,“town elders were typically present to oversee the threshing of the year’s crops.” The threshing floor was also a suitable locale for “legal actions, criminal trials, and public decisions.” The city gate was also used for such proceedings as will later be seen. Sledges were heavy wooden slabs with teeth made of stone, metal or potsherds fastened to the underside. See Isaiah’s vivid description of the whole process in chapter 41, verses 14-16. Whether this was simply to assure that Elimelech’s landholdings would be preserved within family lines, or to ensure there would be a son to carry on the family name, or both, are topics for on-going discussion. Leon Wood, in his book, The Distressing Days of the Judges (1982), addresses both: “When an owner was forced to sell property due to poverty, it was the obligation of the nearest relative to buy this property back (thus ‘redeeming’ it), so that it could remain in the possession of the original family” (p. 261). Wood goes on to comment that “it was the obligation of the nearest kinsman, in this instance, not only to purchase the property of Naomi—which really also belonged to Ruth, because of inheritance rights through her dead husband Mahlon—but also to marry Ruth and raise up a son to Mahlon who might then inherit that property in due time” (p. 262). The word friend (NKJV) and kinsman (KJV) in this verse is taken from a Hebrew idiom best translated “Mr. So and So.” It is translated as such in the Tanakh. This idiom is said to have been used when it was not deemed essential to use the person’s actual name. Some think they detect a certain disdain attached to its usage here, since the relative declined to step in to help. See The Expositor’s Bible Commentary comments on Ruth 4:1-3. 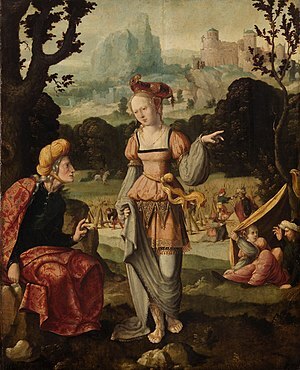 Expositors comments concerning 4:6:”Most scholars interpret the kinsman’s refusal as an awareness that he would be paying part of what should be his own children’s inheritance to buy land that would revert to Ruth’s son as a legal heir of Elimelech.” Others posit he was reluctant to intermarry with a Moabite woman (cf. Deuteronomy 23:3-4). Posted in Bethlehem, Bible women, Boaz, Courage, Elimelech, food, Ga'al, Gleaning, Humility, Kinsman redeemer, Levirate marriage, Mahlon, Moabite women, Naomi, Obed, Profiles, Ruth, Sledge, Threshing, Uncategorized, Winnowing. Bookmark the permalink. But Ruth said: “Entreat me not to leave you, or to turn back from following after you; for wherever you go, I will go; and wherever you lodge, I will lodge; your people shall be my people, and your God, my God. Where you die, I will die, and there will I be buried. The LORD do so to me, and more also, if anything but death parts you and me” (Ruth 1:16-17). The small town of Bethlehem was abuzz—Naomi was back after more than ten years! But where was Elimelech? And Mahlon and Chilion? Who was the young foreigner walking beside her? Why did Naomi look so sad? From the time she entered the gate undoubtedly town elders and townspeople alike plied Naomi with questions. One can only imagine what went through Ruth’s mind, as she, too, encountered first one person and then another, aware of scrutinizing, and sometimes suspicious, eyes. While Israel was enjoying a period of detente with Moab, Ruth was most likely aware of the checkered relationship of their shared past and all that entailed. Now, unfaltering in her pledge of undying devotion to Naomi, she was more resolved than ever to make a new life for herself—Moab, along with its gods and culture, was going to become a thing of the past. She listened as her mother-in-law told and retold the pitiful story of her plight, lamenting, “Do not call me Naomi; call me Mara, for the Almighty has dealt very bitterly with me. I went out full, and the LORD has brought me home again empty. Why do you call me Naomi, since the LORD has testified against me, and the Almighty has afflicted me” (vv 20-21)? For reasons unstated in scripture, she believed her misfortunes were somehow punishments from her LORD. For that, Ruth could offer no solace. The rules of hospitality ensured that the two weary women had a place to stay at least temporarily until permanent arrangements could be made, so they probably found lodging with some of Naomi’s relatives or friends. It is assumed, though, that she quickly returned to her husband’s property, possibly a house that had been rented in the family’s absence or guarded by relatives who remained in the land. At least they would have shelter. Their means of support and sustenance was quite another matter. They had arrived at the beginning of the barley harvest, and Ruth soon learned that Israel had provisions in place to care for the poor including widows, orphans and foreigners: the right to follow behind the reapers and glean the fields. It was hard work for all concerned, and for gleaners it likely represented a tenuous hold on survival. “Since prudent workers worked carefully, the gleaning of the fallen grain was mere subsistence living, much like trying to eke out survival today by recycling aluminum cans” (The Book of Ruth, Robert L. Hubbard, 1988, Google Books, p. 138). She wasted no time in gaining permission to work one of the fields, the owner of which, she learned, was a man named Boaz. At first light Ruth watched as reapers, men who were either hired laborers or slaves, established a time-worn rhythm, grasping the mature stalks with one hand, and using a sickle to cut off the grain with the other. When an armload of ear-laden stalks became unmanageable, the reaper laid them in rows by standing stalls where women waited to tie them into bundles eventually to be transported to the threshing floor. There threshers separated the grain from the chaff, and sealed it in jars for later use. Ruth swiftly moved in behind the laborers, scooping up the precious grist as it fell, and before other gleaners, or avaricious birds could claim the prize. It was backbreaking work, and she did it willingly. Naomi was depending on her. What she did not know is that someone was observing her with keen interest. “Now behold, Boaz came from Bethlehem, and said to the reapers,‘The LORD be with you!’ And they answered him,‘The LORD bless you!’ Then Boaz said to his servant who was in charge of the reapers,‘Whose young woman is this?’ So the servant who was in charge of the reapers answered and said, ‘It is the young Moabite woman who came back with Naomi from the country of Moab. And she said, ‘Please let me glean and gather after the reapers among the sheaves.’ So she came and has continued from morning until now, though she rested a little in the house” (Ruth 2:4-7). Boaz had come from Bethlehem to oversee his fields, already alive with harvest activity. He saw the usual familiar crews, but one stranger stood out among them—according to his foreman, she was Ruth, a Moabitess, the widow of Naomi’s son, Mahlon. Curious, he studied her as she swiftly cleaned between the rows, back and forth in the warm springtime sun. He had already heard of her widowhood, and her devotion to Naomi—it was the talk of Bethlehem. Now, seeing her in person, something about Ruth touched him, and he ordered his crew to see to it that she had plenty to glean by purposely dropping stalks along her way. After a while Boaz sent for her; she came obediently, bowing her face to the ground, struck by the fact that he would take the time to speak to her, a lowly reaper, and a foreign woman at that. After his assurances for her safety, Ruth found herself invited to share the noon meal with the reapers under the shade of a make-shift shelter. She watched as the laborers deftly roasted ears of freshly harvested barley over a ready fire. Boaz himself quickly removed charred husks, and passed parched kernels to Ruth to eat her fill. She must have marveled at his kindness—a man of such wealth and stature. Ruth gleaned until evening, and had still more work to do—separating the grain from the chaff. By the time she finally returned to Naomi, she had enough barley to last them for several weeks. Her mother-in-law was amazed, and upon further inquiry, learned that Ruth was gleaning in the field of a near kinsman of her husband’s. Though Boaz’s benevolence continued to meet the widows’ short-term needs, Naomi knew it simply forestalled the inevitable. Unless something was done to ensure their future survival, very difficult times lay ahead. What they needed was a plan. See Numbers 22 and 25, and Deuteronomy 23:3-6 for the historical backdrop. Watching her was Naomi’s kinsman, Boaz, probably a widower or perhaps one who never married—the Bible doesn’t say. There is no record of any children prior to his marriage to Ruth. Chances are he was older than Ruth—perhaps even by quite a bit—and the record indicates that he was successful—“a mighty man of wealth” of Elimelech’s clan (Ruth 2:1 KJV), making him related to Naomi by marriage. The Expositor’s Bible Commentary, comment on Ruth 2:14. 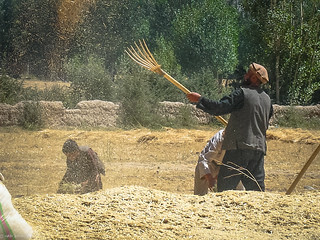 Posted in Barley, Bethlehem, Bible women, Boaz, food, Gleaning, Grains for baking bread, Hospitality, Mahlon, Moab, Moabite women, Naomi, Ruth, Uncategorized. Bookmark the permalink. Then Elimelech, Naomi’s husband, died; and she was left, and her two sons. Now they took wives of the women of Moab: the name of the one was Orpah, and the name of the other Ruth. And they dwelt there about ten years. Then both Mahlon and Chilion also died; so the woman survived her two sons and her husband (Ruth 1:3-5). Naomi had arrived in Moab never suspecting the twists and turns her life would take during the next ten years. Now she found herself robbed of the emotional and physical support of not only her husband, but her two sons as well. In her homeland this would have been difficult enough, but finding herself bereft in a foreign land left her vulnerable, facing a uncertain future. It was only natural that she should think of home—Bethlehem in Judah. She was not entirely alone—her daughters-in-law were quite devoted to her, and she still had her God, although Naomi agonized that perhaps she had fallen from His favor in light of her sad circumstances. Ruth and Orpah were well aware of her dedication to Israel’s God, as they must have seen it demonstrated numerous times over their years together as a family. By her own admission, Naomi was past the time of child-bearing. She knew that chances of remarriage, especially in Moab (and likely in her country as well), had she been so inclined, were virtually non-existent. If she went back to Judah, her husband had extended family there, so potentially she could have emotional support and even, perhaps, some rights of inheritance; she would be back in the land of her God; and if worse came to worse, there were provisions in Israel’s law to take care of widows, orphans, strangers, and the poor (Deuteronomy 14:28-29; 24:19-21). Decisions. How to close down her home, and arrange for travel. Then there was the matter of Ruth and Orpah, both of whom felt a responsibility for her welfare, and she, for theirs. What should she do? What should they do? News from home gave her the answer. By God’s grace, the famine had finally ended, and there was no real reason to remain in Moab. Informing Orpah and Ruth of her decision was no doubt emotional, but still they insisted on going with her. And so it was that the three widows found themselves on the road to Bethlehem, embarking on a journey not only fraught with potential dangers from roving bandits and miscreants along the way, but one which also posed many unknowns concerning what lay ahead. That, however, is not what troubled Naomi most. She was quite concerned for the futures of her daughters-in-law. They would be foreigners in Judah, widows without any means of support or probable prospects for marriage—the plight she herself was fleeing. She pleaded with them, “Go, return each to her mother’s house. The Lord deal kindly with you, as you have dealt with the dead and with me. The Lord grant that you may find rest, each in the house of her husband…” (1:8-9). She kissed them and wept. Naomi cherished them both—they were like her very own daughters (1:11-13). They loved her in return, each in her own way. Eventually a tearful Orpah conceded, kissed Naomi one last time, and returned to the sanctuary of her parents’ home. Ruth, however, was another matter. Orpah, Chilion’s wife, is only mentioned in a few verses in Ruth 1, and then she disappears from the pages of the Bible. People have tried to “flesh” her out, but there is little to go on. The Woman’s Study Bible, in its Topic titled “Orpah, the Daughter-in-Law with a Wavering Faith,” says her name has several meanings: fawn, double-minded, nape of the neck (interpreted to indicate stubbornness or being self-willed). Hence, to some, her actions reflected the negatives attached to her name—she left Naomi for entirely selfish reasons. Even the title of the Topic on Orpah presents a definite bias with regard to her actions. However, as mentioned in the introductory post on The Story of Ruth, depending on names and their meanings is quite subjective. Some draw attention to the statement that Orpah kissed Naomi, whereas Ruth clung to her, inferring a difference of the depth of attachment. The manner in which Orpah returned is in itself viewed subjectively: She was either obediently complying with Naomi’s urging, or she was selfishly looking out for her own future, as well as returning to the religion of her people. Since there is no definitive statement as to her motive, people continue to construct arguments supporting their particular interpretation. Posted in Bethlehem, Bible women, Courage, Famine, Mahlon, Moab, Moabite women, Naomi, Orpah, Ruth. Bookmark the permalink. “Now it came to pass, in the days when the judges ruled, that there was a famine in the land. 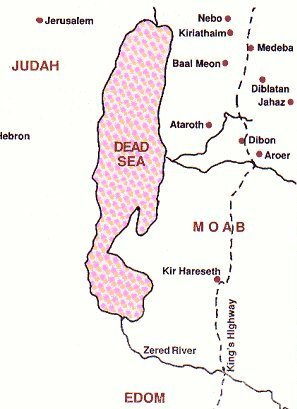 And a certain man from Bethlehem, Judah, went to dwell in the country of Moab, he and his wife and his two sons” (Ruth 1:1). Famine. A word that had major implications for the land of Israel. Usually it started with a period of drought. If that condition lasted three years or more, the prospect of famine loomed large, bringing with it a dwindling and depletion of food supplies for both man and livestock, as well as affecting commercial ventures. It was a word that evoked great dread. Famine. Elimelech and Naomi had undoubtedly lived through such regional natural disasters before and perhaps had even grown accustomed to them, but this famine evidently affected the whole land. Even though they were from Bethlehem, the city of bread (normally a fertile area), they, too, were faced with the specter of impending want. Elimelech made a pragmatic decision: He would relocate his wife and two teenaged sons, Mahlon and Chilion, in Moab until the cycle broke, in hopes they would soon be reunited back in their homeland with family, clan, and Israel’s God. The journey was not especially long, perhaps under a hundred miles, and possibly took less than a week to complete, depending on how many relocation necessities they took with them, whether they had any livestock to care for along the way, and their mode of travel. Though their final location in Moab can’t be determined, it can be assumed that their new home offered potential for subsistence for the foreseeable future. Travel to Moab was evidently unrestricted, indicating a peaceful relationship, at least for the moment. It was relatively close geographically. It was generally a fertile land which received adequate rainfall much of the time, and was evidently unaffected by the famine afflicting Israel. There were major trade routes passing through its borders which could facilitate commerce. Moab was polytheistic, as were many of Israel’s Semite neighbors, though its chief god was Chemosh. As such, it seems possible to me that the family (or at least Naomi) could still worship Israel’s God without consequence. There is no time frame given for Elimelech’s death, nor a reason. (However a later rabbinic tradition says that Elimelech was punished because of greed or because he forsook his homeland.) The same is true of his sons. What the Bible records is that Mahlon and Kilian took Moabite wives, Ruth and Orpah, seemingly after their father’s death, and at some time in the next few years they, too, died, leaving two widows and no heirs. Studious Bible readers are usually not easily satisfied when there are blanks in Bible narratives, such as why these men all died, and often try to fill them in various ways. For instance, The Expositor’s Bible Commentary mentions one such attempt looks for hints hidden in the meanings of the names of Mahlon and Chilion: Mahlon, linked to the root “to be sterile,” “to be weak, ill,” and Chilion, linked to a Hebrew root word which means “to be finished,” “at an end,” or perhaps, “weakening” or “pining.” The commentary then wisely concludes that “in the face of etymological uncertainties, however, it is best not to read too much hidden significance into the names of Elimelech’s family” (comment on Ruth 1:2). Whether they were generally weak and sickly is just not known. After Elimelech’s death, Naomi would naturally have depended on her sons for her survival. When both of them married Moabite women, she would have worked into that context, and still have had a measure of security. But when all the males in her immediate family died she was left with few options. It had been ten years since she first came to Moab, and now her eyes turned back to her homeland. The Keil and Delitzsch Commentary on the Old Testament, regarding Ruth 1:1-5, posits that this famine could have been due to devastations brought on by the seven-year oppression of Israel by the Midianites in Judges 6. Scripture records that Midianites and their cohorts would “encamp against them [Israel] and destroy the produce of the earth as far as Gaza, and leave no sustenance for Israel, neither sheep nor ox nor donkey….So Israel was greatly impoverished because of the Midianites, and the children of Israel cried out to the LORD” (vv. 4-6). This might also be the reason Naomi was in Moab ten years before she heard that prosperity had returned to Bethlehem. Matthew Henry’s Commentary mentions this as a possibility as does The Expositor’s Bible Commentary. There are, however, differing opinions, and the Bible itself does not speak specifically to the causes of the famine. The Encyclopedia Britannica (1973) article on “Moab” mentions Moab’s fertility, and its wealth of wine and grain. See http://www.bible-history.com/maps/ancient-roads-in-israel.html . While nothing is said to indicate Elimelech’s source of livelihood, I feel it is within the realm of possibility that he could have been a tradesman of some sort, and as such, could provide for his family in this foreign land. The Expositor’s Bible Commentary, Ruth 1:3. (Ibid) Rabbinic tradition says their deaths were punishment for leaving Judah and for marrying non-Jews, a view that one can still find on the Internet. Other sources mention there was no prohibition to such a marriage, so the controversy continues. See Expositor’s note on Ruth 1:4a and the Critical and Experimental Commentary as examples. Posted in Bible women, Chilian, Courage, Drought, Elimelech, Famine, Mahlon, Midianites, Moab, Naomi, Orpah, Ruth, Uncategorized. Bookmark the permalink. The Sadducees confronted Jesus with a difficult question that appeared to be a theological puzzle. Actually the question was a red herring to engage Christ in a dispute the Sadducees and Pharisees had about the resurrection. The Sadducees argued that there was no resurrection of the dead, but the Pharisees believed the dead would live again (Acts 23:7-8). To draw a statement from Christ supporting their belief, the Sadducees concocted a marriage situation that had one chance in a million of happening. Unlikely as it was that a Jewish woman would be married and widowed by seven brothers, the law did take care of that earthly scenario. If brothers dwell together, and one of them dies and has no son, the widow of the dead man shall not be married to a stranger outside the family; her husband’s brother shall go in to her, take her as his wife, and perform the duty of a husband’s brother to her. And it shall be that the firstborn son which she bears will succeed to the name of his dead brother, that his name not be blotted out of Israel (Deut. 25:5-6). The Sadducees projected that such tangled affairs would create chaos in the resurrection. Which of the seven resurrected brothers was entitled to the woman who had been married to them all? Or from the woman’s perspective, which of the seven would she be bound to forever? The Sadducees assumed that laws governing physical life would govern eternal life—if there were such a thing. Their answer to the hypothetical confusion physical laws would produce in the resurrection was to reject the resurrection. Christ corrected their misunderstanding of life after death. You are mistaken, not knowing the Scriptures nor the power of God. For in the resurrection they neither marry nor are given in marriage, but are like the angels of God in heaven (Matt. 22:29-32). 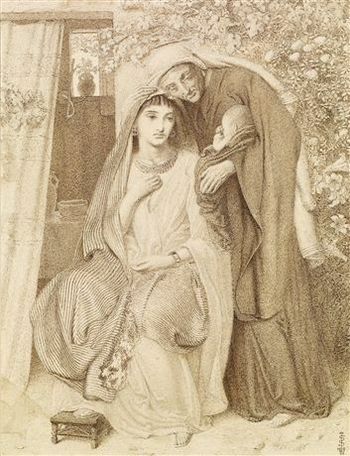 The levirate marriage was an “alternate arrangement under specific bounds to make possible the retention of landed property throughout the families of Israel” and to protect “widows without children.” In the story of Ruth, the levirate law worked beautifully to protect a childless widow, and her deceased husband’s property. Boaz fulfilled the obligations of the levirate law when he married Ruth, Mahlon’s widow. As a near relative of the family, Boaz qualified for the duty of fathering an heir for Ruth’s deceased husband. He was also entitled to the property that would have been become Mahlon’s when Naomi died. From the marriage of Boaz and Ruth, a son was born who upheld Mahlon’s name and property rights. And Boaz said to the elders and all the people, “You are witnesses this day that I have bought all that was Elimelech’s, and all that was Chilion’s and Mahlon’s, from the hand of Naomi. Moreover, Ruth the Moabitess, the widow of Mahlon, I have acquired as my wife, to perpetuate the name of the dead through his inheritance, that the name of the dead may not be cut off from his brethren and from his position at the gate” (Ruth 4:9-10). The levirate law played a part in Boaz’s ancestry, going back six generations to Perez, one of the twin sons of Tamar (Matt. 1:3). Tamar (possibly a Canaanite woman) was married to Er, the firstborn son of Judah. Er died because of an unspecified wickedness that angered God, and Tamar was left a childless widow. In accordance with the levirate law, Judah told Onan, his second son, to impregnate Tamar and preserve the family line of his deceased brother. But Onan refused to beget children for Er. His callous disdain for Tamar displeased God. Onan died for his contempt of duty, and Tamar was widowed the second time. Judah told Tamar to remain a widow until his third son Shelah was old enough to be married (Gen. 38:11). Then he sent Tamar away to her father’s house where she was no longer of much concern to him. Perhaps fearing that Shelah would meet the same unfortunate end as his brothers, Judah seemed in no hurry to facilitate this union. When Shelah was grown and Tamar realized that “she was not given to him as a wife” (Gen. 38:14), she undertook a daring deception. Veiling herself as a prostitute, Tamar seduced her father-in-law, Judah. Not knowing whom he was impregnating, Judah, in a perverse twist of the law, fathered Tamar’s twin boys. New King James Study Bible, Second Edition, Thomas Nelson, note on Genesis. 38:27. Same source, note on Genesis. 38:30. All the Women of the Bible, Herbert Lockyer, p.163. Posted in Bible women, Boaz, Judah and Tamar, Levirate marriage, Marriage in ancient Israel, Onan, Pharisees, Ruth, Sadducees, Uncategorized. Bookmark the permalink. ‘To everything that creeps on the earth, in which there is life, I have given every green herb for food,’ and thus it was so. Then God saw everything that He had made, and indeed it was very good (Genesis 1:30-31). Wheat was one of the grains God said shall make the young men thrive (Zech. 9:17). Almost all biblical references to grain, bread, wheat and flour are positive. Bread made from wheat was a staple in Israel. Fine flour, raised bread and unleavened bread played important roles in Israel’s worship and holyday observances. Jesus referred to Himself as the living bread that came down from heaven—the bread of life (John 6:35, 51). On two occasions, He fed thousands of followers with a few loaves of bread (Matt.16:8-10). Jesus compared the outcome of His death to the fruit borne of a single grain of wheat that dies (John 12:24). But wheat in the 21st century has been linked to health problems. A number of doctors and nutritionists believe that wheat shouldn’t play such a starring role in the today’s diet. They question what’s happened to wheat in the last fifty years and how it’s different from wheat grown 3,000 years ago. They speculate that commercial milling may affect human digestion of wheat. Considering these questions in a biblical setting takes us to the book of Ruth, a romance set in the grain fields of ancient Israel. As the narrator tells the story of a young widow and her devoted benefactor, readers get a sense of how grain was grown and harvested during the time of the Judges. Ruth supported herself and her mother-in-law by gleaning in the field of Boaz, her relative. Six times in reference to his property, the narrator used the word “field” (singular), and once the phrase, “part of the field belonging to Boaz” (Ruth 2). A wealthy man like Boaz may have owned only one field or parts of a field. Boaz called his reapers “my young women” and “my young men,” suggesting that his grain business was small enough to manage with workers he knew. He supervised the fieldwork, ate meals with the workers and joined in the harvest activities. Reaping and gathering were done by hand with the assistance of ox carts to carry bundles to the threshing floor. Ruth carried her own grain to the threshing area and beat out the kernels with a rod. For an owner’s larger harvest, oxen pulled heavy sledges or a millstone over the stalks to separate the seed heads. Using pitchforks and baskets, workers winnowed the seed from the chaff. If Ruth were dropped into a Kansas wheat field today, she wouldn’t recognize uniform stalks bred for mechanical harvesting. It would amaze Boaz to watch high-tech harvesters mowing, threshing, winnowing, and separating grain in one continuous operation. Grain stored as kernels keeps indefinitely without spoiling. Ruth would have stored her barley and wheat as kernels and ground them into porridge or flour when it was time for a meal. Author Sarah Ruszkowski explains that each wheat grain is “made up the endosperm, the bran, the fiber, and the wheat germ. The milling process grinds all these parts together to create a flour. However, the wheat germ is very oily and can become rancid rather quickly when broken and exposed to air. Flour manufacturers must remove the wheat germ for preservation and longer shelf life.” In short, commercial milling sacrifices some nutritional benefit to produce flour with a long shelf life. She adds, “Unfortunately, the wheat germ is the most nutritious part of the wheat berry. By removing the wheat berry, fiber, and bran twenty-eight of the thirty known vitamins and minerals in a single wheat berry are lost leaving only the endosperm,” although millers do add four vitamins back into the flour to enrich it. The fresh flour Ruth made by grinding wheat berries as needed contained all 28 vitamins (especially the B vitamins, vitamins A and E) thought to be important for proper digestion of wheat. The work of Norman Borlaug in the 1940’s and 50’s introduced a variety of short, high-yield wheat that revolutionized feeding the world. But changing the genetic code of wheat might have its downside. It’s not likely that scientists can further the green revolution and simultaneously eliminate any resultant side effects. A time is coming when things will balance. God will return all things to how they should be, a Divine reset that restores the creation to proper functioning. God, man and the land will relate in what Isaiah envisions as marriage. But you will be called, “My delight is in her,” And your land, “Married;” For the LORD delights in you, And to Him your land will be married (Isa.62:4). Posted in Boaz, bread, Disease, food, Grains for baking bread, Land, Ruth, Threshing, Uncategorized, Wheat, Wheat berry. Bookmark the permalink. Barley was a primary food grain in ancient Israel. The Israelites planted barley in the fall at the time of first rain. The seed over-wintered in the ground, sprouted in the spring and was harvested in March to April. Wheat was planted at the same time but it ripened in May to June. Barley could be grown in poor soil and be broadcast into unplowed ground. Barley was a dependable, disease-resistant crop, easier and less expensive to grow than wheat. 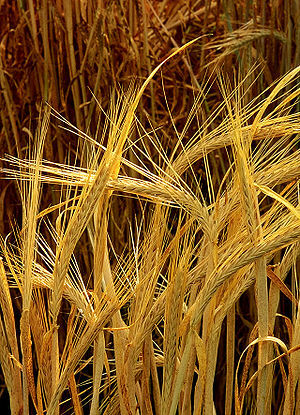 Concerning nutrition, barley surpasses wheat in a few ways: barley has twice as many fatty acids as wheat; it has 40% more fiber than wheat; it contains vitamin E (wheat has none); it contains more thiamine, riboflavin and lysine than wheat “giving barley a more balanced protein.” Barley has less gluten than wheat, which makes it less desirable for making raised breads. The high gluten content of wheat, and the preference for raised bread, caused wheat to become the most important of the ancient grains. Though wheat became the preferred grain in the ancient world, barley still played an important part in the diet of the Hebrews. Israelites ate barley and oats as porridge and flatbreads and fed both grains to their animals. Wheat was not used as animal food. Barley gradually became known as the grain of the poor. “Barley was cultivated in Palestine and Egypt and was fed to cattle and horses. Though the Egyptians used barley to feed animals, the Hebrews used it for bread, at least for the poor.” Barley was fed to horses or mixed with ground lentils, beans and millet to enhance its taste. 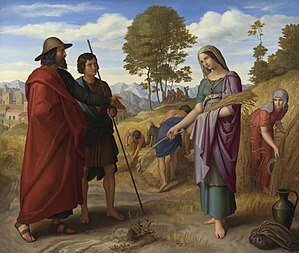 It is estimated that bread provided “50-70 % of the ordinary person’s calories, and the bread eaten until the end of the Israelite monarchy was mainly made from barley.” The book of Ruth illustrates the importance of barley as a life sustaining grain for the poor. Ruth and Naomi had no way of supporting themselves in Moab, so they returned to Israel as impoverished widows. (Ruth 1:20). They arrived at the time of the barley harvest, and found relief through laws established to help the poor (Ruth 1:22, Lev. 19:9, Lev. 23:22, Deut. 24:19). When you reap your harvest in your field, and forget a sheaf in the field, you shall not go back to get it; it shall be for the stranger, the fatherless, and the widow, that the LORD your God may bless you in all the work of your hands. When you beat your olive trees, you shall not go over the boughs again; it shall be for the stranger, the fatherless, and the widow. When you gather the grapes of your vineyard, you shall not glean it afterward; it shall be for the stranger, the fatherless, and the widow. And you shall remember that you were a slave in the land of Egypt; there I command you to do this thing. Ruth was blessed to glean in fields belonging to Boaz, a kind and generous man. His reapers purposefully dropped barley for Ruth to pick up, enabling her to gather more than would have been expected. In the evenings, she returned to Naomi with about half a bushel of barley. Each village had a threshing floor that the farmers shared. A threshing floor made of paving stone or hard-packed dirt was located in flat, windy areas. Farmers piled their sheaves on the threshing floor and cattle trampled over the grain to break up the straw. At some threshing floors, farmers hooked oxen to threshing boards embedded with obsidian chips or to spiked rollers. Both mechanical devices were pulled across the sheaves to break the grain heads free of the straw. 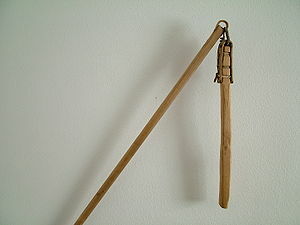 Because Ruth gleaned a small amount of grain each day, it is likely she threshed by beating the grain with a hinged tool called a flail. Farmers tossed the threshed grain into the air with winnowing forks, allowing the wind to blow away the chaff. Women winnowed by tossing and catching the grain in flat baskets. Ruth likely winnowed her grain in a flat basket, keeping her part separate from the harvest. In the evening Naomi and Ruth divided the grain into portions: what would be used immediately, what would be stored and what would be sold for other commodities. They parched grain and ate it warm. They parboiled it for porridge or stew. They ground most of it into flour for bread. I imagine that Naomi took care of the grain that Ruth brought home. The most arduous of her duties was grinding. Grinding “was a difficult and time-consuming task…it is estimated that it required at least three hours of daily effort to produce enough flour to make sufficient bread for a family of five. The earliest milling was performed with a pestle and mortar, or a stone quern consisting of a lower stone that held the grain and a smooth upper stone that was moved back and forth over the grains.” Working with a quern or pestle and mortar, it may have taken Naomi an hour or more of grinding to make enough flour for their daily bread. Ruth and Naomi worked to support themselves. They were grateful for the opportunity to work. Ruth came to the attention of Boaz because she had worked (Ruth 2:11). It has been fully reported to me, all that you have done for your mother-in-law since the death of your husband, and how you have left your father and your mother and the land of your birth, and have come to a people whom you did not know before. God blessed Ruth because she continued to work (Ruth 2:12, 4:13-17). Posted in Barley, Bible women, Boaz, bread, food, Grains for baking bread, Ruth, Uncategorized. Bookmark the permalink.